Dollar/CAD had a lot of good reasons to fall, with the Canadian dollar enjoying oil, NAFTA, and other hopes. Can the trend extend? The loonie faces the all-important rate decision by the BOC, inflation data, and also the implications of the airstrikes on Syria which happened after markets closed. 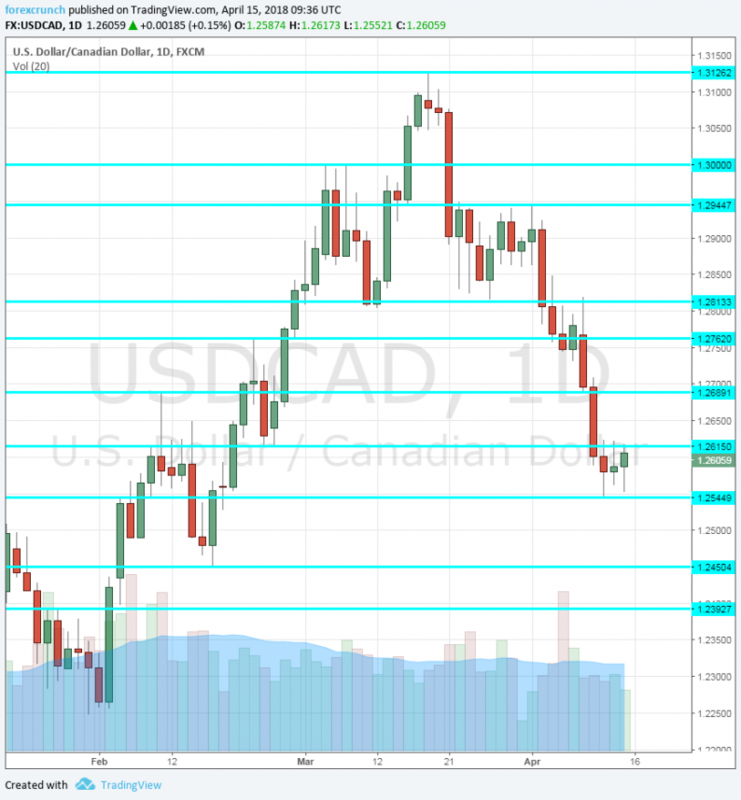 Here are the highlights and an updated technical analysis for USD/CAD. The US, the UK, and France launched airstrikes against Syria, attempting to destroy chemical weapons that the Assad regime previously used against its citizens. Russian President Putin and Iran have condemned the attack and warned of the consequences. Trump called it a “sustained response” but later announced Mission Accomplished. At the time of writing, it seems that we will not see a further escalation. Tensions around Syria pushed oil prices higher, helping the Canadian dollar, but a deterioration of the situation may sour the market mood and weigh on the risk-on C$. This is a double-edged sword for the Canadian dollar. Elsewhere, the advance in NAFTA talks supports the Canadian dollar and also Trump’s willingness to look into rejoining the TPP has supported the loonie. In the US, rising inflation and the upbeat FOMC Meeting Minutes have had a limited effect on the greenback. Foreign Securities Purchases: Tuesday, 12:30. This figure represents flows of money into or out of Canada. The report for January was disappointing with 5.68 billion. We may see a rise now. Manufacturing Sales: Tuesday, 12:30. In the past two month, sales at factory gates fell short of expectations and dropped, with a fall of 1% in January. This time, we may see a bounce back. Rate decision: Wednesday, 14:00. Bank of Canada Stephen Poloz said that the country may see higher growth without triggering inflation. However, inflation did surprise to the upside. The BOC is expected to leave rates unchanged at 1.25% in this April meeting, putting the focus on the new forecasts and the press conference. With contradicting forces moving the economy and the currency, the level of uncertainty is high. ADP Non-Farm Payrolls: Wednesday, 12:30. The ADP report for private sector jobs in Canada is reported after the official number is published. Nevertheless, markets watch it. Back in February, ADP reported a gain of 32.7K. We may see an even larger rise this time, based on the positive outcome in the government report. Inflation data: Friday, 12:30. After a few unimpressive months, inflation in Canada has picked up in February when prices increased by 0.6%. Core figures advanced by 0.7% m/m. The broader core figures are also on the rise: the Common CPI reached 1.9%, the Median hit 2.1%, and the Trimmed CPI also came out at 2.1% y/y. Similar numbers may push the Bank of Canada to raise rates later this year. Retail Sales: Friday, 12:30. While the retail sales report is somewhat belated, it may steal the show. Sales increased by 0.3% m/m in January and jumped by 0.9% on the core read. The report for February could see a setback.